CANCELED DUE TO RAIN!! 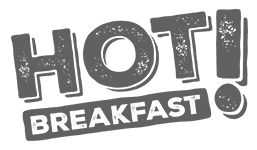 GIG: Sunday, September 9th, 1:30pm: Mushroom Festival, Kennett Square, PA – Hot Breakfast! This came right from the Mushroom Festival organizers themselves. It’s officially canceled for Sunday. 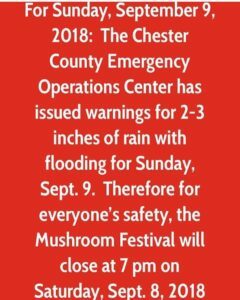 THE KENNETT SQUARE MUSHROOM FESTIVAL HAS BEEN CANCELED FOR SUNDAY SEPTEMBER 9TH DUE TO CRAZY AMOUNTS OF RAIN. At first we thought they’d just cancel the bands due to it being a safety hazard (amplification + rain don’t mix). But they are predicting huge amounts of rain to be falling constantly all day thanks to the remnants of the tropical storm, so the whole event for Sunday, September 9th has been canceled. Ignore everything below this line… it doesn’t apply any longer. Hot Breakfast! makes a triumphant return to the Mushroom Festival in Kennett Square. This year, we’ll be there on Sunday! If you’ve attended in past years, last year (2017) they moved the stage (“The Community Stage”) to a new, easier-to-access location at the corner of S. Union and Cypress, and that’s where it’ll be for 2018 as well. See you there! If you’d like to read more about these bands, click here. Saturday, September 8, 2018: 10 a.m. to 7 p.m. — Sunday, September 9, 2018: 10 a.m. to 5 p.m.
Tickets are $3 at the event entrance. Once you have a ticket (a wristband), you can enter the festival and enjoy everything the festival has to offer, including the music!